India's combined internet speed is 36,000 Gbps! Where does your Internet service provider get internet from? 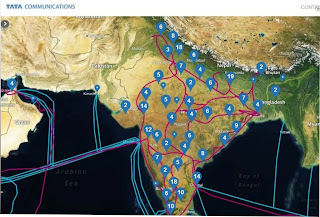 How does Internet reach India? Let us dive into the world of networking . More than 99% of the internet traffic relies on high quality fiber optic cables connecting various countries. Only a minuscule part of the traffic goes through satellites. These cable networks are laid and maintained by various governments and giant companies. Such projects are usually undertaken by multiple companies due to the large cost of investment. There are three tiers which differentiates the size of the network held by a company. 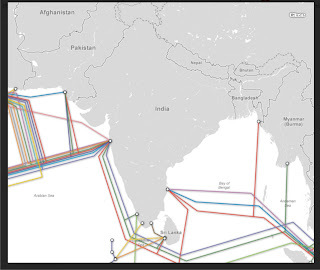 Tier-1 :- This are the companies which have a global network connecting so much cables around the world that they don't need to pay anyone any fee to access any destination on the internet. 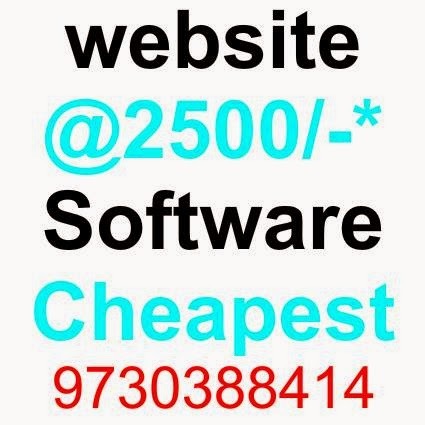 They usually can access the network of other tier-1 companies without paying any fee. This network acts as the backbone of the internet. Tier-2 :- These are companies which have a regional networks and are usually connected to one or more tier-1 networks. They have to pay a fee to access the tier-1 company's network. Tier-3 :- These are the Internet Service Providers(ISPs) from whom we buy our broadband connections. They are the last tier, connecting the internet to the end users. India is connected to the world at Mumbai, Cochin, Chennai and Tuticorine. All of our international internet traffic goes through these port cities. The place where the international cables connect to the land is called landing stations. Tata Communications owns 3 landing stations at Mumbai, Chennai and Cochin. They are the only Tier-1 company from India. Bharti Airtel owns 2 landings stations at Chennai and 1 at Mumbai. Reliance Globalcom owns 1 landing station at Mumbai. BSNL owns 1 landing station at Tuticorine connecting to Srilanka. On the eastern side, we are connected to Singapore from Chennai. On the western side we are connected through cables connecting UAE and Mumbai. And, on the southern side we are connected to the cables coming from south Africa. 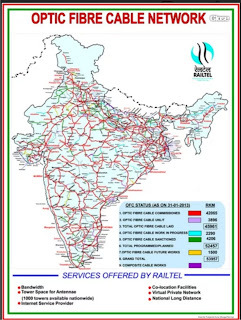 There are several networks within India, one of them is RailTel- a government project started in 2000 to lay fiber optic cables along the routes of the railyway tracks. These cables are capable of bandwidth upto 400Gbps and have redundancy systems which re-routes the traffic incase of any malfunction at any point. They have a network of over 30,000KM. This is a project started in 2011 to connect over 250,000 Grama Panchayaths via high speed fiber optic cable at a cost of Rs 20,000 crore. The plan was to use the existing optical fiber networks of RailTel, BSNL and powergrid to extend the network to more locations. The aim is to bring a minimum of 100Mbps connectivity to each Grama Panchayath. As of 2015, only 40% of the planned network has been completed, the biggest hurdle is stated as 'right of way problem' which in simple words means people are not allowing to lay cable over their land. India used 967 petabytes per month in 2014 and is increasing at a rate of 33% per year. It is expected that it will grow to 4 Exabytes by 2019. According to a newspaper report from 2013, India has a total international bandwidth of 33,900 Gb per second although only around 6,009Gbps are ready to use while only 1,110Gbps are consumed. Certainly this figures must have increased by now. 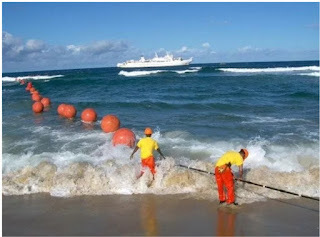 A new cable landing station in Digha, West Bengal connecting south east Asia was approved for Rs 1600 crore in 2011. Since then, I haven't heard anything about this project. A new connection is being established from Bangladesh to Agartala. 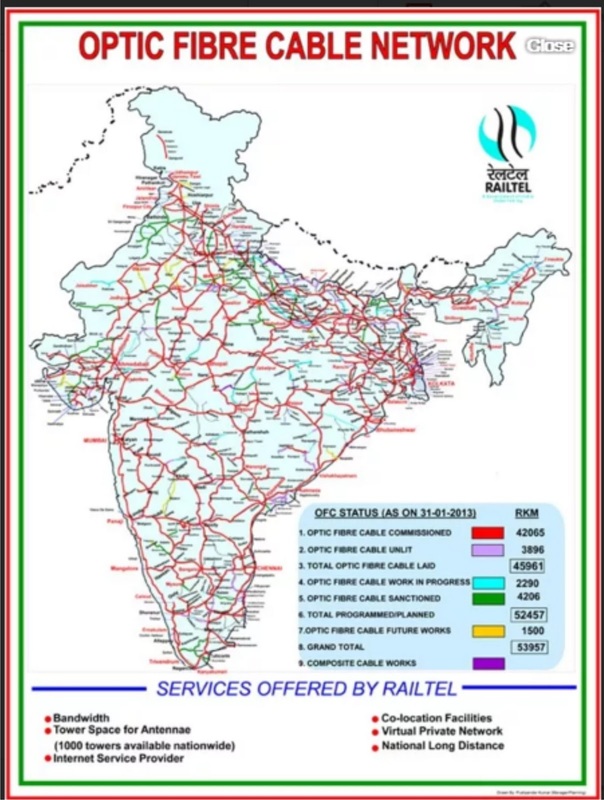 This will give better connectivity to North eastern states. This project was signed during PM Modi's recent visit to Bangladesh.